The long-necked Falcarius lived during the early Cretaceous period (Utah Museum of Natural History)). Part of what makes therizinosaurs so baffling to scientists is that they can't comfortably be assigned to any existing dinosaur family, although theropods are certainly the closest fit. To judge by some clear anatomical similarities, it was once thought that these dinosaurs were closely related to prosauropods, the sometimes bipedal, sometimes quadrupedal herbivores that were distantly ancestral to the sauropods of the late Jurassic period. That all changed with the discovery of the middle Cretaceous Alxasaurus, a primitive therizinosaur equipped with some distinctly theropod-like characteristics, which helped put the evolutionary relationships of the entire breed in sharper focus. The consensus now is that therizinosaurs evolved in their unusual direction from an earlier, more primitive branch of the theropod family. From a biologist's perspective, the oddest thing about therizinosaurs wasn't their appearance, but their diet. There's a convincing case to be made that these dinosaurs a) used their long front claws to slice and dice copious amounts of vegetation (since these appendanges were too ungainly to slash fellow dinosaurs), and b) harbored an extensive network of intestines in their prominent pot bellies, an adaptation that would only have been needed in order to digest tough plant matter. The inescapable conclusion is that therizinosaurs (distant relatives of the prototypically carnivorous Tyrannosaurus Rex) were largely herbivorous, in much the same way that prosauropods (distant relatives of the protopically plant-eating Brachiosaurus) probably supplemented their diets with meat. A stunning recent discovery in Mongolia, in 2011, has shed some much-needed light on the social behavior of therizinosaurs. An expedition to the Gobi Desert identified the remains of no less than 75 therizinosaur eggs (genus undetermined), in 17 separate clutches of a few eggs apiece, some of which had apparently hatched before being fossilized. 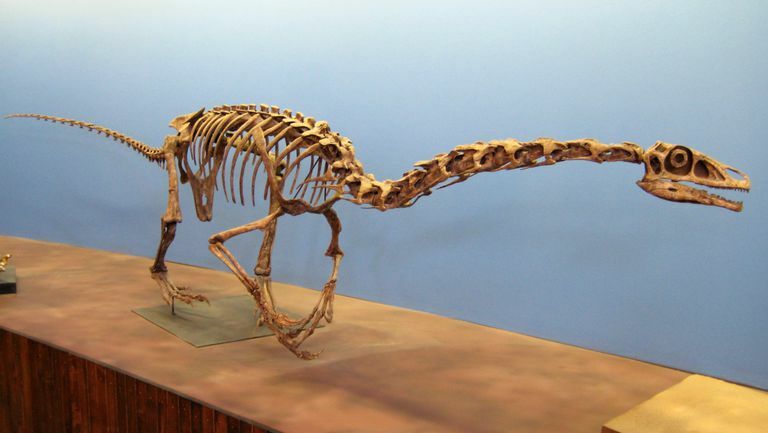 What this means is that the therizinosaurs of central Asia were social, herding animals, and may have provided their hatchlings with at least a couple of years of parental care before abandoning them in the wild.